(X-Men: Emperor Vulcan#1 (fb) - BTS) - A secret cabal within the Shi'ar Empire organized the Shi'ar Death Commandos, a unit composed of warriors from various extraterrestrial races, and sent them to Earth to slay Marvel Girl (Rachel Grey, who once wielded part of the Phoenix Force) and all related to her. (Uncanny X-Men#468 (fb) - BTS) - The leader, Blackcloak, was tasked to brand Marvel Girl according to canon law, and brand her according to civil law. The brand would allow the Shi'ar to always track her. (Uncanny X-Men#466 - BTS) - On Earth, the Commandos surrounded the home of John and Elaine Grey. (Uncanny X-Men#467) - Unable to decipher who Rachel was among all those inside, the Commandos initiated their secondary objective, that of slaying all those who were biologically related to Rachel. Over the next 24 seconds, multiple targets were killed, including Gailyn and Joseph Bailey, Derry Campbell, Phyllis and Roy Dennefer, Brian and Julia Grey, John Grey, Fred Harriman, Julian, Kindra, Liam, Terry Maguire, Mary-Margaret, Roger, and Bekka Wallis, leaving only Rachel and Elaine Grey alive. At Blackcloak's orders, Sega sealed the area under a force-shield, but Nightcrawler, Psylocke, and Shadowcat of the X-Men managed to teleport in. A deadly battle ensued that ended up with the three X-Men unconscious. Blackcloak then marked Marvel Girl with the phoenix tattoo. (Uncanny X-Men#468) - The X-Men stopped the Commandos from killing Marvel Girl, and the Commandos gathered around to attack. Bishop, Cannonball, Colossus, and Rogue of the X-Men broke through Sega's shield and joined their allies in attacking the Commandos. More X-Men approached (Cyclops, Gambit, Emma Frost) with Sentinels, and Blackcloak killed Elaine Grey in a blast meant for Marvel Girl before the Commandos surrendered. (Uncanny X-Men#470) - After being incarcerated in Manhattan for a time, the Commandos tracked Marvel Girl to Chicago, though they fought Bishop and Detective Charlotte Jones on their way out. A few of the members were downed in the fight, and Jones was lost through Blackcloak's cloak. The Commandos utilized their orbiting Shi'ar ship to teleport to Chicago, where they attacked Marvel Girl in the office of Dr. Maureen Lyszinski. (Uncanny X-Men#471) - Marvel Girl fled with Lyszinski across Chicago with the Commandos in pursuit. The X-Men (Bishop, Cannonball, Nightcrawler, Psylocke) and a Sentinel arrived to aid her, and the Commandos were defeated quickly. The Shi'ar ship dropped a bomb to kill all below, including the Commandos, but the X-Men managed to block it. The crew of the starship was apprehended and the Commandos were presumably jailed again. (X-Men: Emperor Vulcan#3 (fb) - BTS) - The Commandos began acting as the private guard to Chancellor Araki in Shi'ar space. (X-Men: Emperor Vulcan#3) - Araki entered with the Shi'ar Death Commandos for a meeting with Vulcan (current emperor of the Shi'ar), Deathbird, and the Guard (Gladiator, Manta, Nightside, Oracle, Starbolt, Titan, Warstar). Inside, they found Ka'ardum, Lilandra, and the Starjammers (Ch'od, Havok, Korvus, Marvel Girl, Polaris, Raza). Marvel Girl grew furious at seeing the Commandos and lashed out in a powerful attack, sending the Commandos scattering, and threatened Araki's life, even accusing him of running the secret order of the Shi'ar and ordering the death of her family, until Polaris stopped her. The Commandos soon departed peaceably. (X-Men: Kingbreaker#1 (fb) - BTS) - When Vulcan focused on expanding the Shi'ar empire via conquest, he put the Imperial Guard on the front lines along with the Shi'ar Death Commandos, though many were reported killed in battle with Marvel Girl. (War of Kings#4) - Gladiator and the Starjammers met with Councilor D'bek, with whom they interrupted a speech of Araki's in order to proclaim Lilandra ruler of the Shi'ar once again. They fought back Araki's secret order and Lilandra announced her return to rule with mighty cheers from the crowd. As Chandilar broke out in war around them, Lilandra, flanked by the Starjammers, headed toward the temple to claim her right to rule. The Shi'ar Death Commandos then attacked, Sega permeating the crowd with his clouds. Blackcloak killed D'bek with a thrown spear. Marvel Girl furiously hit Devo with a telekinetic blast as Polaris used magnetism to crush Krait's wings. Lilandra stabbed Offset with a spear as Korvus and Marvel Girl tried to get her to cover. As the Commandos began reigning death on the crowd, Gladiator quickly took down Hypernova and Warshot before Flaw attacked him. As Blackcloak held off Gladiator with his spear's energy blast, Araki ordered the others to kill Lilandra. One of the Fraternity of Raptors hid himself in the crowd and fired multiple shots, one of them killing Lilandra during the chaos. Commandos in this mission: Blackcloak, Devo, Flaw, Hypernova, Krait, Offset, Sega, Shell, and Warshot. (War of Kings#5) - As Chandilar erupted into civil war, Gladiator targeted Araki and his secret order. Blackcloak rushed to protect Araki, successfully plunging his spear through Gladiator's chest, but Marvel Girl killed Blackcloak with a telepathic burst, then Gladiator killed Araki. (Wolverine & the X-Men I#10) – When the Phoenix Force approached Earth, the Shi’ar Death Commandos (Colony, Flaw, Krait, Offset, Shell) were sent to kill its host and stop all who stood in their way. (Wolverine & the X-Men I#11) – The Commandos crashed Wolverine's ship and attacked Hope Summers. Hope held off Krait and Offset, then Flaw impaled her while Colony held off Wolverine. She then manifested part of the Phoenix Force, knocked out all five of the Commandos, and healed herself. (Wolverine & the X-Men I#13) – The Commandoes revived and joined Gladiator in the battle against the X-Men. Marvel Girl savagely held them off. (All-New X-Men I#23) - The Imperial Guard (Astra, Oracle, Titan, Impulse, Manta, Smasher, Electron, Plutonia, Mentor, Hussar, Flashfire, Scintilla, Warstar) and the Shi'ar Death Commandos (Krait, Flaw, Devo, Offset, Sega, Colony, Hypernova, Warshot) were ordered by Gladiator to stand by while they put the young teenage Jean Grey on trial for crimes she would commit in the future as the Phoenix. (Guardians of the Galaxy III#13) - The Imperial Guard (Plutonia, Oracle, Flashfire, Gladiator, Manta, Smasher, Warstar, Titan, Impluse, Mentor, Electron) and Krait of the Death Commandos faced against the Starjammers, the X-Men, and the Guardians of the Galaxy, but the Guard was stopped nearly single-handedly by Jean Grey, who manifested a new power source. Oracle ordered the Guard to retreat, and Gladiator reluctantly agreed. Comments: Created by Chris Claremont, Chris Bachalo and various inkers. It was purported that Araki founded the Shi'ar Death Commandos and sent them to Earth. 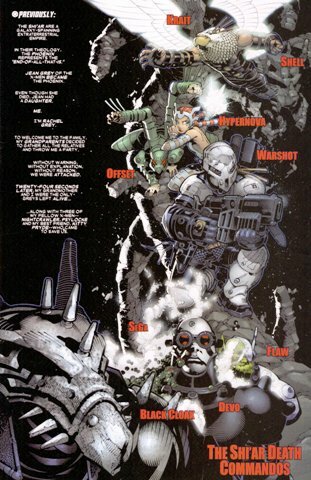 It has been suggested by various creators that the Commandos is a military team much like the Imperial Guard, and that when one member is killed, another from his or her race takes his or her place.